Is there a tool to create Spellcasting 101/201/301 type games? Does anyone know of an authoring system (or even better, and Inform extension) to make games like the old Spellcasting series? Glulx touches a few of the edges… but I thought it was a cool interface and was looking to see if there was a tool we could use to reproduce something closer to it. 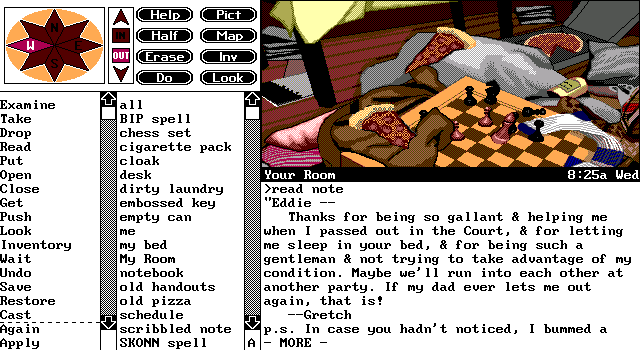 From what I remember, those Legend games were kind of a hybrid adventure system with still pictures (having occasional animation or changeable sprites) no on-screen avatar, and there were multiple panes of word lists of nouns and verbs to construct sentences which were then parsed? I don’t know of any available system that does all that straight out of the box - especially the word-lists with sentence-building. Off the top of my head, the closest you could get to something like that in Inform 7 would be to use Vorple but it’d be a lot of work. Possibly also using “Flexible Windows” to throw words into lists. I’ve seen quite a few posts trying to get Flexible Windows working with an unofficial update of “Glulx Entry Points” which begins treading into Frankenstein’s Monster territory with regard to constructing an interface - at least for someone like me who likes to stay safe within the confines of an IDE! I’d be interested to see a prototype of something like this working. I hope others have better suggestions. I have been working with “Flexible Windows” and “Simple Graphical Window” using “Glulx Entry Points” (official only, not going there again… using unofficial leads to insanity) but not getting what I want yet. If I come up with something, even partial, I will post it. Here’s another thread with Vorple discussion and links to examples if you’re interested. I will definitely look at this tomorrow. Until then, Goodnight all! INSTEAD allows you to have graphics, music and construct commands with word lists in hint mode (default on when playing on Android & iOS). Currently no game examples in English but there is an English parser library (the behaviour follows Inform 6). Are the docs not localized for INSTEAD? I looked at it in the past, but there was something that kept me from getting into it. Mm, the most difficult part in Glulx is going to be clicking the words. Now, I can think of a way to make it so you can click words to build an input, then when you type a character it goes to text entry (with those words pre-filled)—and a way to make it so it switches back to the word-clicking-input-building mode when you click another word—but I don’t think it’s possible to preserve what the user’s typed when they click a new word (it would wipe it all out). The best option I can think of would involve fundamental changes to Glk, which…isn’t really a good solution. No, when you cancel a line input event the buffer will be filled, so you could append to it, and then resume the line input. But it would be a lot of work, basically from scratch. A Colder Light was similar. I can’t remember what technology it used, and I’m not sure if it’s still online anywhere. But a Glulx version is in the archive. Both Vorple and Instead seem worth a try… neither is exactly what I was looking for, but could easily do the same job. Maybe even better because of less clutter. Thanks for the tips. Instead does seem like it would have a steeper learning curve. But the end result might be worth it. Still, if anyone has their hands on the Legend archive of tools… I would love to know what they used. Okay… Vorple is AMAZING. Working through the docs, I tried the Wikipedia look up function. This solves multiple issues I hadn’t even begun to address yet thinking they were going to be too difficult. Thank you @Juhana Leinonen!